Donald Robertson is a writer and cognitive psychotherapist. 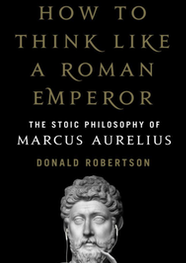 He is the author of How to Think Like a Roman Emperor: The Stoic Philosophy of Marcus Aurelius (St. Martins Press, 2019). Did one of Rome’s wisest and most revered emperors benefit from an ancient precursor of cognitive psychotherapy? The Roman emperor Marcus Aurelius mentions undertaking Stoic “therapy” (therapeia) at the start of The Meditations, his famous journal of personal reflections on philosophy. He writes, “From Rusticus, I gained the idea that I was in need of correction and therapy for my character.” Junius Rusticus was one of Marcus’ closest and most beloved advisors, a mentor to him in Stoic philosophy, perhaps even serving as a sort of therapist or life coach to the emperor. Marcus mentions that he struggled at first to manage his own feelings of anger with certain individuals, including Rusticus. There are numerous references to psychological strategies for anger management scattered throughout The Meditations. It’s a topic to which he keeps returning, at one point listing ten different techniques for overcoming anger. He describes these Stoic therapy strategies as gifts from Apollo, the god of healing, and his Muses. For instance, he advises himself to pause when becoming angry with another person and first investigate whether or not he’s guilty, or at least capable, of similar wrongdoing himself. Of course, bearing in mind our own imperfections can prevent us flying into a rage with others and help us move closer toward empathy, understanding, or even forgiveness in some cases. Marcus also frequently recounts the use of psychological techniques for coping with pain and illness. Research shows that’s another problem with which cognitive-behavioural therapy (CBT) can help. Marcus had a reputation for physical frailty and poor health in adulthood. He particularly suffered from chest and stomach pains, poor appetite, and problems sleeping. His Stoic mentors taught him to cope, though, by using mental strategies such as contemplating the temporary nature of painful sensations or their limited intensity and location in the body. Rather than allowing himself to think “I can’t bear it,”, he’d focus on his ability to endure pain that was more intense or lasted longer. He learned to accept painful feelings and other unpleasant symptoms of illness, to adopt a philosophical attitude toward them, and find more constructive ways of coping. The Stoics wrote books specifically dedicated to the subject of psychological therapy, such as the Therapeuticsof Chrysippus. Although these are now sadly lost, we can perhaps infer something about them from a surviving text by Marcus Aurelius’ famous court physician, Galen, titled On the Diagnosis and Cure of the Soul’s Passions, which outlines an eclectic approach to philosophical psychotherapy but cites earlier Stoic texts as its inspiration. What we learn is that an aspiring philosopher should seek out an older and wiser mentor, someone he trusts to examine his character and actions, exposing flaws in his thinking through observation and questioning. Aaron T. Beck, the founder of cognitive therapy, another form of CBT, repeated this claim with regard to his own approach. In his first book on the subject he also quoted Marcus Aurelius’ version of the saying above in a more antiquated translation: “If thou are pained by any external thing, it is not the thing that disturbs thee, but thine own judgement about it.” This simple concept has been so influential, both in ancient philosophy and modern psychotherapy, because people find it of practical value. From the 1950s onward, psychologically research increasingly lent support to the techniques of cognitive therapy, and in the process of so doing we might say it indirectly validated the practices of ancient Stoicism. There’s an important difference, though. CBT is a therapy; Stoicism is a philosophy of life, albeit one containing many therapeutic concepts and techniques. CBT is normally remedial, outcome-oriented, and time-limited. It treats problems that already exist. The holy grail of mental health, nevertheless, is prevention because as we all know: prevention is better than cure. Stoicism not only provided a psychological therapy, a remedy for existing problems like anger and depression, though, but also a set of prophylactic or preventative psychological skills, designed to build what psychologists today refer to as long-term emotional resilience. The historian Cassius Dio, for instance, praises Marcus Aurelius for the remarkable physical and psychological endurance that he showed in the face of great adversity as the result of his lifelong training in Stoicism. Stoic philosophy therefore holds promise today as a means of expanding the findings of CBT beyond the consulting room and the limited duration of a course of psychotherapy. It can provide a model for applying evidence-based psychological strategies to our daily lives on a permanent and ongoing basis in order to build emotional resilience. For its modern-day followers, Stoic philosophy has once again become a way of life.